Years ago, while perusing Larousse Gastronomique, I saw a beautiful photo of a cherry clafoutis. The clafoutis had been baked in an emerald-green provençale dish and had been placed on a black-and-cream-colored toile de Jouy cloth that covered a shady spot beneath an ancient olive tree; an antique tin bucket, full of sparkling ice and a bottle of wine, had been set on the ground next to the clafoutis. It all looked so delightful! I had to eat clafoutis! So I made clafoutis (several times) and each time I wondered: how can fresh eggs, butter, milk, sugar and sweet cherries turn into THIS mess, this eggy, soggy pile that becomes inedible just minutes out of the oven? Being tempted to buy a perfume you have not smelled is a lot like finding a new recipe: you read the ingredients, look at a gorgeous illustration, and think “I love everything in this! It sounds and looks delicious!” Acting on a hunch that everything will work out fine, you prepare the recipe (or, as the case may be, buy the perfume). Sometimes you relish the result. Sometimes you become nauseous. I’ve had decades to learn my perfume lessons. I know I shouldn’t buy a fragrance without sampling it beforehand; I know I shouldn’t commit money and perfume-shelf space to a fragrance before wearing that fragrance all day. But every so often, too often, while searching the internet or thumbing through a magazine, I read an enticing perfume review by a writer whose tastes I share, or I learn one of my favorite perfumers has a new cologne on the market, or I succumb to exotic advertising images — and I order a fragrance without the benefit of smelling it first. Such “bought-unsniffed” purchases are extremely risky and if you buy something you hate at first sniff, you are not only disappointed but you’ve wasted money — which can add depression and guilt to the disappointment. And what to do with a newly bought but immediately forsaken bottle of perfume? Toss it? Swap it? Sell it? Give it away? Use it to scent the car or garage? In the past four weeks, I’ve bought three fragrances before sampling them. My first unsniffed purchase of the month was Annick Goutal’s Duel (2003). Reasons for purchase: I love many Annick Goutal scents; I had read several positive online reviews of the fragrance from perfume bloggers I trust; Duel’s ingredients were promising: iris root, leather, Paraguay seeds, maté leaves, absinth and musk; I liked the perfume’s name with its aura of danger. When I tried Duel for the first time, its scent smelled lighter, more sprightly, than I had imagined it would. There was certainly no whiff of tension, no frisson, in Duel’s formula. On me, Duel smells of black tea with hints of lemon and tangerine. There is only the slightest touch of leather in Duel, and as the scent develops I smell an “iced” iris accord — imagine ‘iris-scented frost’ on your skin. The musk at the end of Duel’s development is civilized and smooth. Duel is light, but if sprayed with wild abandon (8-10 sprays) its scent will last all day. Satisfaction level: HIGH. Cost: discount price — $40 for 100 ml. Emboldened by my success with Duel, I hit the “Place Order” button once more and a bottle of Christian Dior’s Jules (1980) was on its way to Seattle. Reasons for purchase: Jules is a rarity (I have never seen a bottle in any store; I have never known a person who wears it); the day I ordered Jules, I was in a foul mood, and bored, and I ‘needed’ to buy something to raise my spirits, so why not perfume? Jules contains galbanum, black pepper, Russian leather, sandalwood and cedar wood. During the first minute after application, Jules reminds me of a more masculine, raw-edged and forceful Vol de Nuit. Jules’ opening is powerful, yet refreshing. I wake up at 4:30 a.m. each day and Jules’ slightly ‘floral’ galbanum-and-pepper opening provides a pleasant “kick.” Jules’ Russian leather, sandalwood and cedar have a slight sweetness but also some bite — there’s a great balance between smoothness and roughness in the blend. As Jules develops on my skin I smell an interesting, lusty musk-cola accord. Jules works its ingredients to perfection, making fragrances with 10 times its ingredients seem tame and lame in comparison. 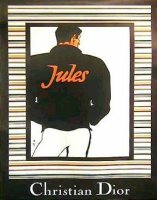 Jules is a rich, dark and long-lasting cologne. Satisfaction level: HIGH. Cost: $80 for 100 ml. Heady with my Duel and Jules successes, I bought one more fragrance without sampling it — Acqua della Macchia Mediterranea from Borsari di Parma’s Viaggio in Italia series of scents. Reasons for purchase: I love traveling in Italy! I love the Mediterranean! I remembered a glowing description of Acqua della Macchia Mediterranea in the comments section of a post on this website. Satisfaction level: LOW. Cost: discount price — $14 for 3.5 oz. Please share your latest (or most famous) unsniffed-purchase tales. I would love to hear success stories, but we can agree, can’t we, that the failures provide, after the initial sadness, the most laughter? Great stories Kev. Now I want to sniff Derby (Duel left me cold like most Goutal's do…and MM by Borsari I love,love,love – go figure). I've probably spent a mortgage payment or two on disappointing perfume, but sometimes it's thrilling to order something unsniffed. My last unsniffed purchase was a $25 bottle of PdN Vie de Chateau. I love the warm hay drydown but am not crazy about the grapefruit jello opening. I have the same feelings as you about clafoutis, although it makes a good breakfast the next day. I found a similar recipe, but Italian, that is more cake-y, and better, I think. Funny, most of the un-sniffed stuff I've bought is when I've been pregnant. Being to big to buy clothes and also too big to waddle out to the stores I do alot of surfing on the perfume blogs. Sometimes I find it more fun to wait for the UPS man than to smell the perfume for the first time. Could this one be THE one? All about the hunt I guess. My most recent disapointments have been Cartier's Delices, of course the parfum, and I hate it. Then all the way from London, AP's new Strip, which smells like a cross between Obsession and Givency's Organza Indecence. Which I also hate. I'm even more mad that I've wasted $ that could've and should've gone to this un-born kids college fund! PBI: Louve was on The Perfumed Court now! Great article! Perfume is ideal for boredom/foul mood-buying, especially if I am at a store, as a new scent can change my whole outlook. Better than a new hat! I bought a mini of Shalimar unsniffed, but at the time I thought, hey, it's *Shalimar*, how can I go wrong? I hate it. It's like minty pepto-bismal on me. I bought Vie de Chateau unsniffed also, spurred by a glowing review and the low price. I actually love it, and that purchase prompted a little love affair w/ PdN, bcs. I want to support anybody who produces quality scents in usable and affordable little bottles. Love the comparison betw. reading recipes and perfume ingredients – that's it, exactly. Great post! So funny. I have yet to read your entire post, but I want you to know that I LOVE cherry clafoutis since becoming enamoured by reading a recipe a few years ago. You're probably unwilling to try again, but the one in the 1998 version of Joy of Cooking is particularly yummy to me, especially if you throw in some cognac. Anyway, I look forward to reading the rest of the post about your 'unsniffed' disasters. All I can say is thank GOODNESS for folks like the ones running The Perfumed Court. They are like my idea of true angels. I, and my checkbook, are forever indebted to them (perhaps quite literally). I bought NU unsniffed too! And I can so relate – it actually HURTS my nose. It smells awful on me. wahh. CB Musk, and I was well pleased. From the official description, L'Heure Bleue sounded like my Holy Grail. I quickly acquired a bottle and….it was Extrait de Play-Doh. Waah! Where was my promised armful of flowers wrapped in a delicate, powdery aroma? Tocade, however, turned out to be perfect. Roses and vanilla, just as promised. And it can be had so cheaply! My bottle cost $8 on Ebay. My most recent was Caron Parfum Sacre, which is currently winging it's way towards me. I've been putting in my cyber-cart and taking it out again for months. I try to tell myself that I should be saving up for one of my more expensive to-buys, but that logic seems to fail after 11:00 p.m.
hi, i'm glad there are other people doing silly things like buying perfumes unsniffed:) now, the thing with me is, i've only started sniffing, amassing, collecting, reading etc. about perfume a while ago, i guess that's why i get so easily excited about everything (just like you wrote, hmmm, ingredients sound delicious, the bottle and the ads make it even better and the price, oh well, let's hit the bid button!). needless to say, reading perfume reviews has become my favorite obsession. on top of that, i live in a european coutry where there are no niche perfumes and the shelves of perfumeries are filled with mostly 'ordinary' stuff, so no big excitement in this area. that's why it's almost impossible to sniff before buying what i want. so i decided, buying unsniffed is ok, however, it's either miniatures or the bottles have to be strikingly cheap that much to my purchasing policy. my last blind buy was ferre-GFF on ebay, a big one for 12.00 EUR…and it's very nice. re the clafoutis, so far, i cannot figure out why, but everytime i make it, it turns out to be not right. so no luck in this department. a tricky one and looks so easy. Alright! You've dared me. I've wanted to make cherry clafoutis for ages. I just like saying the word. Clafoutis clafoutis clafoutis! Now I'm gonna make it. And it's gonna turn out edible. Yes. It will! No, only MM – I'd NEVER even heard of this line before a week ago. MM reminds me of the discontinued stunner by Calvin Klein, 'Calvin' – a lot. Quite herbal and cuddly at the same time. And crazy cheap…you could gargle with it for the price! TS: just be prepared for it to be more like a thick flan or egg pudding with fruit in it — as opposed to a cobbler or cake-like concoction. Maybe someone will release a frag with notes of traditional “clafoutis aux cerises du Limousin”. Best unsniffed purchase – hmm, I've had a lot of them. I've been lucky. Some of my faves were unsniffed: OJ Champaca, Mauboussin Histoire D'eau Topaz, and Chanel Bois Des Iles. I've taken flyers on great scents like Yvresse, Chergui, Yohji Homme, Hiris, New York. Probably my worst unsniffed purchase was Knize Ten. Great fragrance, I think, but doesn't work for me at all. Kevin: Forgive me! It's the mind that goes first. I did read all three of your reviews of Guerlain's “women's” fragrances that could be worn by men. I guess I'm just so enamoured with your writing that I can't wait for your next submission about anything! Sorry, Kevin, but using clafoutis as an example for this post is just not on: yours ended up being a mess because you didn't make it in the right way. Clafoutis is absolutely delicious, whether it's made with cherries, plums or any other soft fruit. There! Apart from that, I agree with you that one can never tell from a list of ingredients how a fragrance will turn out to be. The vocabulary used to describe perfume is so evocative and seductive, the number of ingredients/notes so small and the number of combinations of those ingredients so huge. I would never buy a perfume unsniffed just as I would never buy a painting unseen. I'm too reasonable, I know. Oh my, over the past four years I've suffered from multiple scent-personality disorder. Needless to say, my dissapointment list could fill out a dictionary with descriptions like “ugh”, “Eeeeh-yuck” and “No–Whyyy?!”. However, one of my biggest let-downs would have to be Creed's “Love in White”. I knew better–really. Anything that has “white” in it tends to turn acrid and rancid on my skin. I ignored the nagging feeling that I was investing in another bottle of b-s. Bowing before The Perfumed Court, with both hands in the air!!! Bow.Bow.Bow.Bow.Bow.Bow.Bow.Bow.Bow.Bow. ROTFL! I've been compared to quite a few things in my life, but 'an imposing Athena marble statue' is a first. Thanks, I love it! Kevin, sadly I have had a similar clafoutis experience. So delicious looking, yet so gooey and sad tasting. I'm way too impoverished to buy anything unsniffed, however I have had the opposite experience, where I've read a list of ingredients that sound utterly unappealing. Somehow they magically smell wonderful once applied. This happened when I tried Lancome's Attraction (patchouli & iris? Yeechh!) but wound up loving it and receiving many compliments. Another was Annick Goutal's Mandragore (boxwood, spearmint?) and it wound up being a favorite! The only untested/unscented fragrance I ever bought was Guerlain Meteorites. I liked the idea of it, but took one sniff and sent it back to Sephora. Isn’t it discontinued now? I am trying to limit myself now to buying ones that I have actually tested on me (buying miniatures first, using samples, finding a used bottle on Ebay for half price, etc) but sometimes I buy a new one. My latest is Gualtier Classique, which I love. It is strange though because when I was younger I HATED this perfume, but I love how it smells on me now. Hi, everybody!!!!! Well, I also have experience in buying unsniffed. Sometimes is bliss (Angeliques sous la pluie FM, Cologne Bigarade FM, Bigarade Concentré FM, Rousse Serge Lutens, Mandarine-Mandarin Serge Lutens,Divine Bergamote TDC), and sometimes a total disaster (En Passant FM, I just hate it, have worn it only a couple of times). There are even so-so unsniffed purchases (French Lover FM). The worst thing about it is that we perfume-addicts tend to purchase expensive niche brands, so….But I also have the sad experiences of buying sniffed AND completely fail (great in the shop, boring at home). Are we mad or what? For the clafoutis, may be are you just a bad cook ? Clafoutis is a delicious dessert. If you wanna change, you can also do it with plums. For 'Bought-Unsniffed’ fragrances, I have a very simple recipe, the same as Robin : I don't buy unsniffed. I must be making clafoutis wrong, too. I think this post is supposed to have opposite effect, but for some reason I have a sudden urge to immediately purchase something unsniffed. While it can be disappointing upon arrival, there is nothing like the anticipation of receiving a brand new unsniffed scent. I believe that last full bottle purchase I made of something unsniffed was Cristobal. I admit it's not groundbreaking but it is perfectly nice and I do not regret the purchase. Yes, alas, Meteorites is discontinued. It came in a 30 ml EDT only and smelled like the scent used in the Meteorite powder beads—violets. The bottle was clear, round and flat and looked like the compact that the pressed powder still comes in, with a gold filigree to represent Marie Antoinette's original boudoir design. But of course, Kevin!!!! I always try to make my mistakes small, haha. Well, French Lover was not a mistake, only a so-so (fortunately). Everyone is beating you up about the d*&*#-ed clafoutis, aren't they? I had read in somewhere that Americans don't tend to like soggy foods, and I think that is true. I certainly do not. So it could be that you made a fabulous clafoutis, but it is not to your taste. What is a buckle, by the way? Oh K, so glad your unsniffed purchase of Jules turned out well for you. It's one of those fragrances that I will never understand why it's not more popular even now. Hm, scratching my head trying to think of my last unsniffed purchases. I think it's probably a bunch of Russian perfumes from Novaya Zarya and the “Polar Lights” house. The results were mixed, but the Barber of Siberia frags from Novaya Zarya were particularly enjoyable. And NZ's bottle for their Kremlin fragrance is so fun to look at that it was almost irrelevant what it smelled like (it is perfectly nice smelling, though.) Only just got the Polar Lights ones finally from Moscow a few days ago, so I've not yet had the chance to suss them out really – should be fun, though! Outside of that, I tend to only ever risk buying vintages unsniffed. Which even if they aren't perfumes I like, it's still worth the effort and can be instructive, no? The strawberry one is the No. 1, and it's pretty fun. I can't say it's a jaw dropper, but it's one of those rare strawberry frags that doesn't smell off-puttingly artificial and plastic. Kind of got a strawberries dipped in white chocolate vibe going on. I actually like the No. 3 a little better, even though I'm not generally a citrus frag kind of gal. I dunno, just guess it feels really refreshing during these weird bursts of summer heat and humidity we seem to be getting lately. Just a word of advice – there's a seller from the US ( cosmeticbag.com) that sells a goodly number of NZ's offerings, and they are SO MUCH faster than trying to go through some of the Russian importers. And if you do order from there, try the totally cheap but charming Carnation eau. It's like 3 or 4 bucks, and very simple, but much more charming than most of the cheapies that populate US drugstore shelves. Kevin, I got my first bottle of Jules by Christian Dior when it was first released in very early in 1981. My partner at the time was in Paris and I begged him to buy me a bottle from the Galleries Lafayette, unsniffed. I was thrilled to receive it when it arrived, and I still relive that wonderful era when men's perfumes were but a handful at department stores and male-oriented fragrances smelt oh-so-masculine. It brings back powerful memories of my life then as well. Sadly, I have never been able to locate this fragrance since, and although there are a few vintage bottles scattered around on the internet, I would like to purchase a fresh bottle to use and cherish. I shall continue my search! My sincere apologies for this belated thanks regarding where to buy Jules! I didn't see it and didn't receive a notification of it, so while researching a few noses and fragrances, I was led back to this article and noticed your comments. I'm thrilled. Thank you, thank you, thank you! Hence, I’m rather picky and many beautiful perfumes tend to turn into a disater on my skin I never buy unsniffed. I wonder where can you buy Duel so cheaply? aperfectdrug: Annick Goutals can be had for a song at many discounters…just do a froogle.com search…or eBay search. Thanks Kevin! Will do. Have a nice weekend. Any suggestions as to where I might find Jules for sale? I had been looking for a Serge Lutens rose that was darker than Sa Majeste so when Fille de Berlin came out, I bought it unsniffed. Its one of my favorites now.